This passage came back to me this week as I have been reading Kenneth E. Bailey’s Jesus Through Middle Eastern Eyes. It took me back to a staff retreat day in March, 2010, where I first met my friend and mentor Marilyn Borst of The Outreach Foundation, a day that changed my life. She used this passage of the inauguration of Jesus’ ministry to launch into her topic which was the church in dark places. This week as I read Dr Bailey’s chapter on this passage, I was struck anew as to just how radical Jesus was with his message of loving God and loving our neighbors. Dr. Bailey writes that Jesus took a very familiar passage from the book of Isaiah, chapter 61, verses 1-7, and edited it as he read to bring a new message to these people. These folks knew this passage as a prophecy which would put them in charge and their oppressors underneath them, to be dealt with as they had done. And Jesus turned it on its head. He uses sermon examples of Gentiles being open to faith in Yahweh, the God of the Israelites, not of conquering Hebrew heroes like David or Solomon. And where they had thought his sermon started out well, in the end they just wanted to kill him. Salvation comes from beyond the community; it is not community generated. Ministry involves proclamation, justice advocacy and compassion. Compassion is meant to inform both witness and advocacy. It’s not really a text for Advent, and yet that is when I am taking this all in, and recent news stories cause me to stop and think about it. I wonder what Jesus would think coming to the U.S. as many of us light the candles of Advent leading up to Christmas? Watching the news yesterday morning I heard a story about one of the most popular Christmas gifts this year: a new gun. The store owner interviewed even stated that “best way you can show love to your loved ones this year is “to give them a gun.” For the ladies they even had thigh holsters covered in bling. We have presidential candidates talk about shutting doors to Muslims, carpet bombing Syria until the desert sands glow, hating the media (“But I wouldn’t kill them,” added as an afterthought), and insulting every ethnic/gender/faith group except the one that looks like them. We have people saying, “Merry Christmas!” like it is a threat instead of an invitation or salutation. We get up in arms because a huge chain of coffee shops has a red “holiday” cup instead of a “Christmas” cup, but pay $7 for the coffee anyway. But where are we when the only cup that really matters is lifted humbly with a plate of bread? The cup poured out for all that we might have life. The cup of the one for whom we light those candles each week. I am grateful for that day back in March, 2010, when Marilyn introduced me to the church in dark places, for I have been gifted to walk with them in Syria, in Lebanon, in Iraq. They remind me that Jesus is not an American, not a pandering politician, not a guy peddling $7 coffee in a red cup, not a guy carrying a gun with a concealed-carry permit, not a it’s-Merry-Christmas-not-happy-holidays! season’s greeter yelling back at the customer service rep. He is the Christian woman declaring on a bus stopped by Syrian rebels that the young Alawite man next to her is her son, and they may not take him. 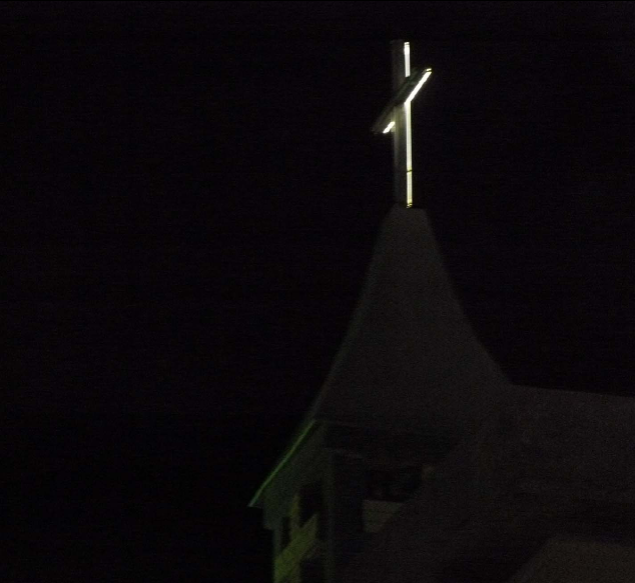 He is in the Shi’ite neighbors guarding the church in Basrah, saying that rebels will not bomb this church. He is in the evangelical school in Tripoli, in Sidon, in Kirkuk, in Baghdad, in Aleppo, in Homs, educating Christian and Muslim together in the ethics of reconciliation. 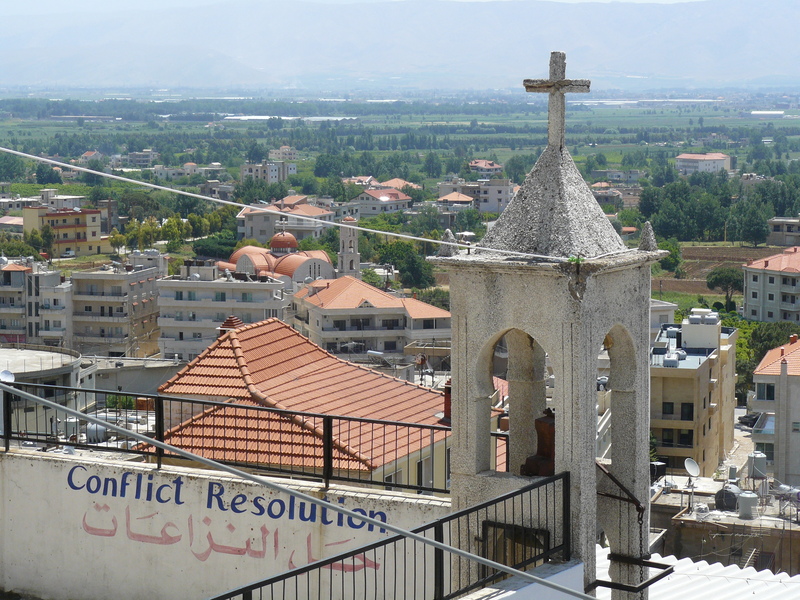 He is in the woman of the Bekaa Valley who ministers to the refugees of the war next door, knowing that her own family is in danger. He has come from outside of every community, in judgment over our selfishness, our hatred, our greed, our twisting of the meaning of his birth. He offers us the compassion of his lifeblood poured out for us and invites us to the table of grace. He is the mighty God, prince of peace, wonderful counselor. He is Immanuel, God with us. Let us light the candles for this one. It’s Wednesday night and for the last fifteen years that has meant choir practice. 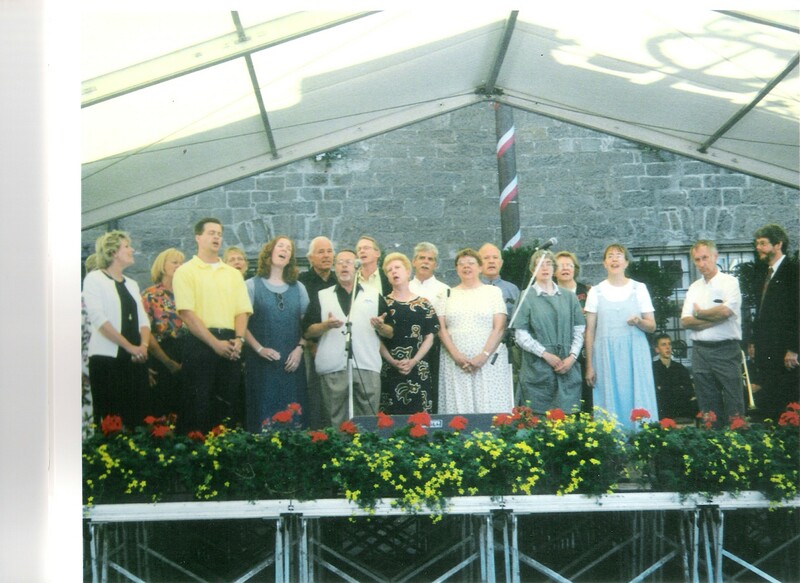 Here is the 2000 West Hills Church Germany team. We were not the choir but we sang like one! Advent, 2000, I decided to take the invitation at our church to join the choir and sing for the season. Four Sundays, two services each. Christmas Eve, two services. I think it entailed five Wednesday nights for a total of ten hours of practice to sing Christmas carols and anthems for ten services. And this year, 2015, I will be singing two Christmas Eve services for the sixteenth time. I’ve said it before that my favorite place (after the spot next to Steve) is in the middle of a choir. It is a glorious spot! All those voices blending in sweet harmonies, minor or major keys, pianissimos and fortissimos and the mezzos in between, leading a congregation or other audiences to a place of musical and heavenly bliss. Tonight it hit me so closely what this particular choir – the West Hills Church chancel choir – means to me, and especially at this season. It is Advent. And it is my birthday season which follows the same calendar. That is not hubris. That is just the way I experience this holy season and always have. It is hard to not associate your birthday with Christmas when your birthday is December 19th and your father told you years before that your birth was induced so you would be able to make an appearance at the family Christmas Eve gathering at the home of your grandparents. All month long there are lights and music and bustling. Surely, the fact that you have a late December birthday must be special. It could have been Christmas! So fifteen years ago I started singing in the choir at West Hills Church and tonight it struck me deeply that in all those anthems and carols and Wednesday nights and Sunday mornings, Maundy Thursdays and Easters, the eves of Thanksgiving and Christmas, the cantatas, the madrigal dinners and the occasional retreats, one of the very best birthday gifts I have ever received was to stand in the middle of this heavenly chorus and blend my voice with theirs. In my fifteen years we have seen Dwaine retire, David lead us to Germany, Matt fail to lead us in the Hallelujah Chorus on Easter, Jared humbly try to lead but also to sing in our Gospel choir and Michael to lead us in a new season of real ministry as director. We watched Cliff struggle with Alzheimer’s and every week take a new copy of each piece of music until his folder bulged and we always knew where to find a piece to supply someone else. We sang with Mary – who loved the low, low alto notes! – and gathered at her funeral service when cancer took her. We sadly let Barb and Virginia retire to the pews to listen to us instead of sing with us. We prayed for Stan earlier this year when his father died and just this past week as he lost his mother. We said good-bye to Sherrie as her last Sunday to sing with us just passed. She and Joe are retiring to Kansas City. We have welcomed the young William and Sherri this year to sing with us and the more seasoned Kevin and Patti. We have celebrated high school graduations, college graduations and even new grandbabies. They gathered around me before we sang on Maundy Thursday in 2013, the day after I had learned that my youngest sister Cathy had been murdered. I wanted them all to know tonight in this my birthday season that they have been such a gift to me! Fourteen years ago tonight was Wednesday, December 19th, my 43rd birthday. Two nights later, Steve gave me the best gift ever when he proposed. The following Sunday the choir was the first group I told and they were over the moon for us. I have so much family. My siblings. My extended blood relations. My in-laws. My ink family at the print shop. My brothers and sisters in Christ across the globe. My creative Omaha Press Club family. Mike, Stan, William, Dan, Barb, Ida, Trink, Sherri, Grace, Priscilla, Patti, Jane, Stan, Martin, Bill, Kevin, Michael and Kathy, I thank my God every time I remember you. Thank you for letting me stand in your midst, raise my voice with yours in harmony, and sing to our Lord for his glory. Pam Kragt and I worked together for eight years at West Hills Church. Pam left her job this past January to pursue her dream job. It didn’t turn out to be the dream, but it in a period of waiting this summer, that dream did materialized for her. She is serving the people she loves the most, the Greatest Generation. It is her mission call and she was gifted by God for that purpose. She does it well! I left six months after her and am in my waiting period as my new journey of school begins in January. We are two women who found a way to be friends and sisters in Christ even though we represent the two ends of a political spectrum that can be very divisive. We had our moments, oh yes, we did. But at the end of the day and the end of our time on staff together, we were grateful that the common ground we shared was much broader and connecting than our political divide. We remain friends. But now that we are not serving together, we haven’t seen each other since January. Pamela Sue, as she is known professionally, came to sing the Christmas program at church for our 55 and over group. Yes, I qualify. I earned my way in two Decembers ago when I hit the double nickel birthday. I didn’t really want to go, but Jana did, so we went. I was happy to see Pam again and hear her sing. When we served on staff together, there were times when we would just start singing a hymn in the workroom at church. I would take the melody and Pam would just purr out her beautiful deep alto harmony. She learned all those hymns growing up in the church in northwest Iowa. For me, they were all fresh and new and singing with Pam in the workroom was just a joy. 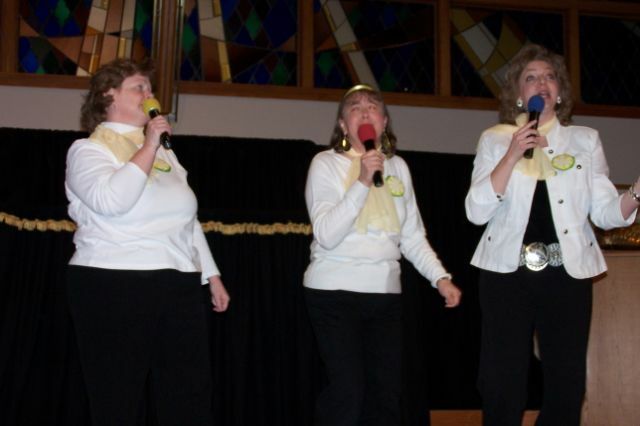 One year for the annual church meeting known as the Super Supper, we formed a fabulous trio with our friend Kathy Padilla: The Lemon Sisters. Our motto was “When life gives you lemons, make lemonade for the Lord!” Our original song, West Hills Mission Trip, sung to the tune of Route 66, was a big hit that year. This little group would pop up periodically to provide light entertainment and provoke laughter as we did in a sadder moment at church in 2013. Pam Moore was heading to Colorado Springs to take a new job after the death of her husband and our pastor George the year before. We gathered together as a staff to send her off and the Lemon Sisters were there to do it up right. This little video always makes me smile at the memory. She had prayed. For me. She wanted to do a song. I thought maybe she was going to sing Sentimental Journey which we had done as Lemon Sisters, or maybe I’ll Fly Away. But that wasn’t it. She couldn’t look at me as she introduced the song because she started tearing up. The truth is as she began to talk, I teared up myself. She said as she rehearsed it she would see me and my heart for the people of Syria. We had talked so many times about the places God has called us to, her to senior citizens and to Honor Flights and me to the church in the Middle East. She had heard me ask for prayers so many times for them, that they would know peace. And so many times in staff prayer she would be prompted to pray for them. Always, even in our differences, we would find the words to pray for each other’s hearts. And today, for me and for the peace of Syria, she sang this song by Michael W. Smith. I have written before about my birthday season. I have a season because my birthday is in the time of Advent, the Christmas season. The gifts I receive come on many days, not just the nineteenth of December. And so officially, today, December 4, 2015, my 57th birthday season began with the gift of song from my friend, Pam.